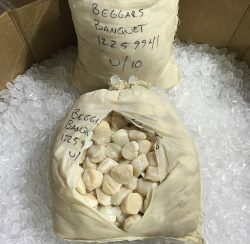 This Week’s Seafood Order: Day Boat Scallops from New Bedford, MA! Fresh caught scallops from New Bedford, MA. The scallops are dry-packed and completely natural – not soaked or treated. Day Boat Scallops – $26.99 per lb. Try this simple and delicious recipe! Grab your tomatoes and pesto when you pick up your scallops!!! Orders will be taken through Thursday at 11am this week, and will be here for you to pick up on Friday after 11 am. Call us at 633-2830, stop in, or email us at info@farmersandartisans.com.